02/01/2014 - HEADLINES UPDATE: We will reopen April 20, 2014!!! We would like to extend a word of THANKS to our customers who remained loyal to us during this unfortunate incident and hope you enjoyed our alternate location. We look forward to you staying with us in the Future! Again Thanks! Our staff is available in person from 3:30 pm to 10:30 pm and By Phone 24 hrs each day. If you call and are sent to out voicemail system please leave a message and we will return your call as soon as we finish seeing to our on-site Guests needs. Thanks! 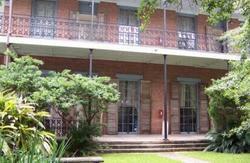 We are still the closest hostel to the French quarter – only five blocks! Don’t be fooled! We also have an overflow location in the Carrolloton area only four blocks from the streetcar line, with a bus to downtown leaving directly from in front of the door. And did we mention our free pancake breakfast? We are operating at full capacity. We have central air and heat plus a commercial generator in case of a power outage. Never be in the dark! After a stroll in the French quarter, a walk on Bourbon St., or just a tour of the city, come back and relax in our courtyard with music, have a cool drink or relax in your room with cable TV, mini refrigerator, television and ceiling fans. Don’t forget to book now for upcoming events – and save on taxi and bus far by checking out our special airport pickup; ride in comfort and style, just look for the white Lincoln. Step out the airport to your ride! Only $20! If you wish to book this, our contact information will be in your booking confirmation. A message from Ms. Kansas Montgomery (owner) - thank you to all the guests who have visited with us and have embraced the culture of our unique city! Thank you for the favourable reviews; we are by far one of the best hostels in the city. Remember: this is a hostel. We do not provide daily room service but we would be glad to provide extra towels, etc, upon request. We do want our guest to be comfortable as well as have a great time! Our hostel is only eight blocks from world-famous Bourbon Street and minutes from Canal Street. We’re situated in a quiet and secure neighbourhood, just one block from the HBO filming of Treme; come check us out and maybe be an extra! We’re perfect for your trip to New Orleans. Weekly and monthly dorm and private room rates are available. We look forward to having you stay with us in 2014 and beyond! Take I-10 east toward downtown and take the Esplanade Avenue exit, making the immediate right turn. Proceed one block to N. Robertson Street, turn right and go 1/2 block. We're at 1129 on the right-hand side directly across the street from the church. Journey time is about 15 minutes. We offer airport pickup for only $20 per person. Ride in comfort and style in our white Lincoln! Our contact information is in your booking confirmation email.